All photos courtesy the introducers. Headliner is quickly becoming the growers' first choice. This mounded petunia boasts early flowering for a fast finish and a dramatic colour range. The result: eye-catching finished baskets and pots with large blooms! Boldly goes where no petunia has gone before. Light years from the usual! Headliner Pink Sky and its sister variety, Headliner Night Sky, may have the most distinctive blooms you’ve ever seen on this plant. Headliner Pink Sky is primarily pink/rose but features eye-catching splashes of white/cream. 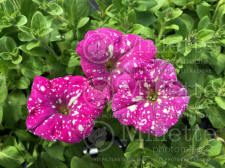 Put your paintbrushes away, this new petunia has done the paint splatter job for you! 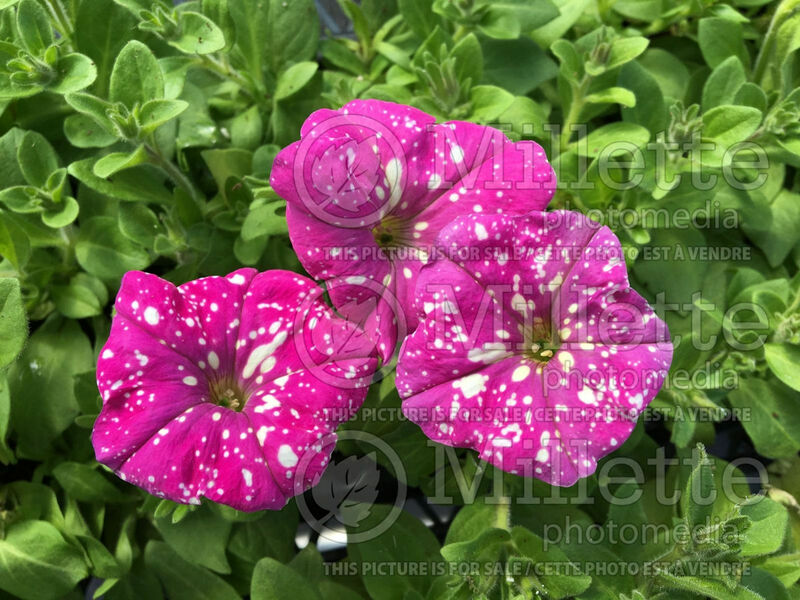 This hot pink petunia is very similar to the Night Sky petunia in that it has white polka-dots all over the petals, it looks like someone splashed paint on it! The white spots will change in intensity depending on the temperature throughout the summer. Combine with Cabaret orange Calibrachoa and Cabaret yellow for some sunset coloured fun! This Headliner will be the star of your garden. Grows 25-41 cm tall and 51-76 cm wide. My second new plant for this week is another Petunia—P. x hybrida ‘Success Yellow Chiffon’. Maintain temperatures 13° C nights for the first 6 weeks to initiate flower bud development; night temperatures can be lowered further to 10° C to encourage basal branching and compactness; however–lower temperatures may also substantially decrease the number of flowers initiated; growing at cooler temperatures will produce a higher quality plant. 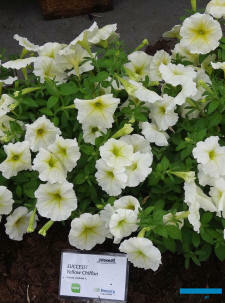 New to the Success petunia series, Yellow Chiffon features light yellow blooms that don’t relax or fade. Earliest to flower–seven days earlier than the competition! Most uniform flowering. Flowers look up! Mounded habit shows more colour. Excellent garden performance. Perfect for containers and hanging baskets. The third new annual for this week is an impatiens—I. x hybrida ‘SunPatiens Pink Neon’. Many of these are introductions through the major Proven Winners branding. Proven Winners plants are available at fine garden centres across the country. Each garden center makes its plant selections based on regional growing conditions. If the Proven Winner variety you want for your garden is not available, please ask your garden centre professionals if it's available by special order or if there is another Proven Winners variety they would recommend as a substitute. Before you head to the garden centre, please call the retailer to confirm product availability. Self-cleaning; no deadheading necessary. Impatiens will do well in the ground or in containers. While many Impatiens are often sold in hanging baskets they need a lot of water to do well and it may be difficult to maintain appropriate moisture levels during the heat of the summer. They will be easier to keep hydrated in large pots or in the ground. They will do best in shady locations, but have been shown to do fine in hot sun as long as they are well watered. If the plants do get dry and are wilted, even if they are severely wilted, water them immediately and they should bounce back within several hours. They are generally easy care with little to no maintenance, other than watering, necessary. If you do want to trim them to improve habit this can be done at anytime using a sharp pair of scissors or pruning shears. A yearly application of fertilizer or compost on garden beds and light fertilization of plants in pots will help ensure the best possible performance. Calendulas are known as English marigolds on the other side of the pond! 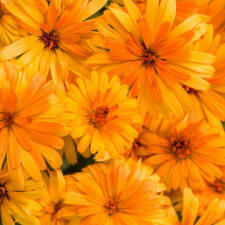 The next new annual for this year is Calendula hybrida ‘Lady Godiva Orange’. Broaden your annual collection with Lady Godiva™ Orange. The 2.5 cm (1 inch), fully double golden orange blooms are nestled above slender green foliage and have an airy appearance. 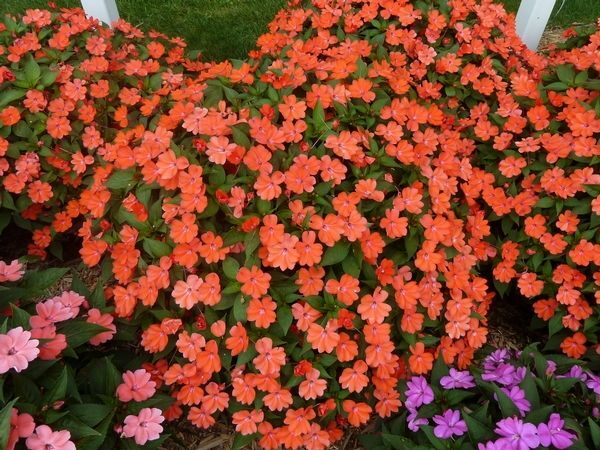 Forming a 25–41 cm (10-16 inch) low growing mound, Lady Godiva™ Orange is recommended for borders, edges, and container plantings. Hardy in zones 7-11, Lady Godiva™ Orange is an annual elsewhere. Handling cool temperatures as well as the heat and drought, this English Marigold is a very versatile addition to your garden. Continuously blooming, you will notice the butterflies fluttering about. No need to worry about the deer, Lady Godiva™ Orange is a deer resistant annual. Planted in full sun to part shade is where Lady Godiva™ Orange will feel most at home in your garden. Fully double flowers of Calendula ‘Lady Godiva Orange’ means less seed set and fewer seedlings trying to take over your garden. The next new annual for this week is grown primarily for its foliage rather than flowers—it is a Coleus; now known as Plectranthus scutellariodes ‘Main Street Ruby Road’. Main Street coleus are a series of coleus varieties named for famous avenues. Every variety grows well in sun or shade and flowers late (allowing the leaves and habit to remain at their best). They also have the same vigour as one another, making it easy to grow more than one variety in a container together. Coleus' attractive serrated pointy leaves are mahogany to purple with a hot pink centre and lime green edge. 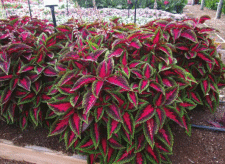 Bushy and compact, it is a great coleus for pots and edging a border. Very sturdy and a good grower. Sun tolerant. Flower spikes in shades of purple and blue. Keep flower buds pinched since unchecked blooming will cause the plant to go into decline. New to the Main Street coleus series, Ruby Road features a vibrant mix of hot pink, burgundy and chartreuse. The Main Street series also added La Rambla for 2018. 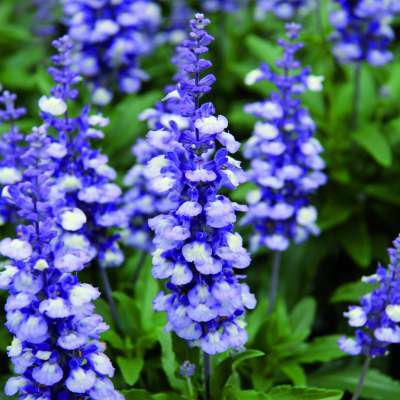 Finally this week a new blue Salvia—S. farinacea ‘Farina Arctic Blue’. 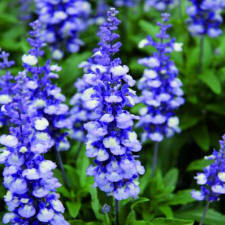 The Salvia Farina series have huge full flower spikes, which grow to 45 cm (18-in.) tall and hold their colour all season. Available in Arctic Blue, Bicolour Blue, Blue, Silver Blue, Violet, and White. The perennials grow to a height of 50 to 80 centimetres (20 -31 inches) and about the same width. They form dense to sprawling clumps. Salvia farinacea is a deciduous plant with glossy mid to grey-green, simple leaves. They are arranged alternately along the stems and have petioles to 1,5 centimetres long. The leaves are lanceolate to ovate-lanceolate and have serrated or entire margins.